After nearly 17 years, it’s back in print. All 20 years…..
And you don’t have to wait for an issue to appear on Ebay to get your copy. 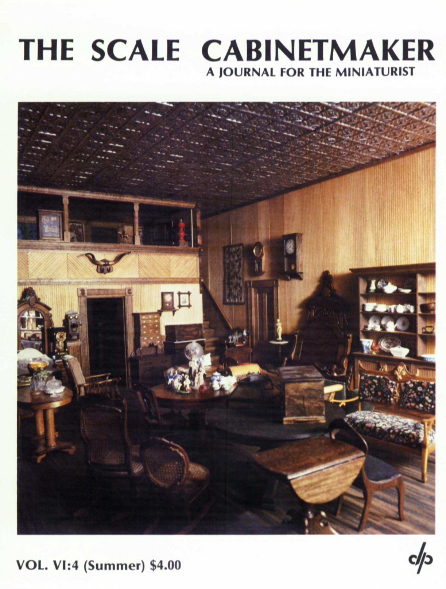 At a recent miniature show, a young woman came up to the Dorsett Publications booth, took one look at the display and at some of the old back issues of The Scale Cabinetmaker and the TSC index, and announce that the journal was legend. While we can’t attest to its legendary status, The Scale Cabinetmaker remains the only place where you can find information on the broad range of scale modeling topics. The Scale Cabinetmaker was a quarterly “how-to” journal for miniaturists. It was the first of its kind and remains the only periodical geared to the folks who like to build miniatures. In some ways, the term “periodical” was and remains a misnomer. By the end of its 20-year run, The Scale Cabinetmaker was more of an encyclopedia for the scale modeler than a magazine. Our subscribers came from all sorts of hobby fields, including miniatures, ship modeling, and model railroading. While they may not have always been interested in the particular models, they loved the technique and tool articles. To understand The Scale Cabinetmaker and the driving force behind its original publication, we invite you to read “Why Scale?,” Jim Dorsett introduction to TSC. While many in miniatures are familiar with the name The Scale Cabinetmaker, few know the name of the actual company, Dorsett Publications, or the folks (Jim & Helen Dorsett) who were responsible for its appearance in local miniature shops. 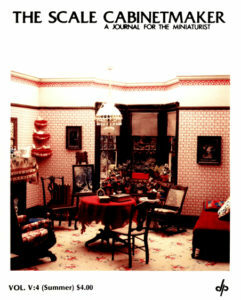 Dorsett Publications (which was founded by Helen Dorsett) is a family-owned company dating back to 1962, the year our first “how-to” miniature publication, The Cabinetmaker’s Guide to Dollhouse Furniture, was being developed. The company and the books predated Nutshell News (1970), NAME (1972), and IGMA (1978). We invite you to explore the world of The Scale Cabinetmaker and Dorsett Publications.